New. With the Full Power of Probiotic KE-99. Restora RX™ patent protected probiotic lactobacillus KE-99 for increased comfort of your digestive system. KE-99's patented probiotic strain has excellent resistance to gastric acids, bile and pancreatic juice. 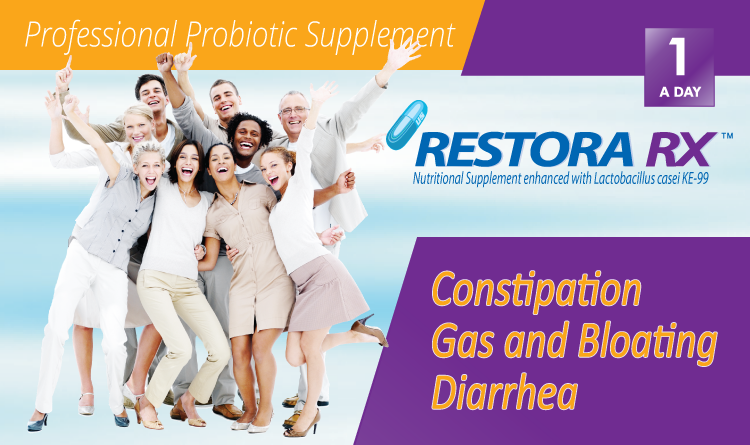 As a result, Restora RX™ has a greater chance to reach your entire digestive system. KE-99 combined with flax seed oil can increase the recovery, growth and efficacy of the probiotic. Odorless, tasteless and easy to swallow: Take one Restora RX™ capsule a day between meals or as prescribed by physician. Restora RX™ is manufactured with Vcaps® capsule shells that are Kosher certified, Halal certified and Vegetarian Society approved. Restora RX™ is 100% gluten free, fat free and sugar free.